Generously transcribed & submitted by Nancy Bray, thanks Nancy! 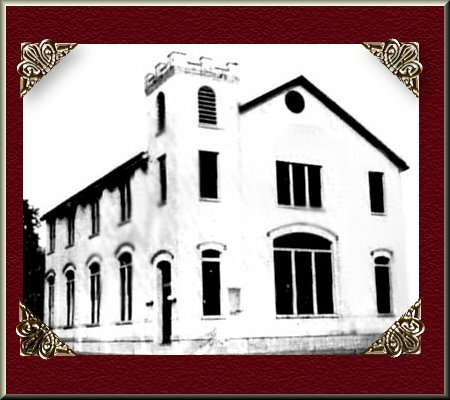 Today, May 23, 1954, we are happy to welcome you to the Falmouth Methodist Church. It is a glorious day for you and us, and we trust that you will visit with us again. This little booklet is intended to bring to its readers a brief history of the Falmouth Methodist Church for the past one hundred years. We dedicate it to the faithful and consecrated pastors and members, both past and present whose labors have brought us along the Christian Way of Life. When a certain Paul C. Lair of this city, by written obligation, donated to the Falmouth Methodist Episcopal Church, South, a lot in the town of Falmouth on the corner of Main Cross and Upper Mill Streets (the streets now known as Shelby and Maple Avenue), it marked the beginning of one of the leading Churches of Falmouth today. The members of the Methodist Society, as it was called in the early eighteen hundreds, had no regular meeting place, first meeting in the homes of the members and later in the Courthouse in this city. The small Methodist Society, which was an appointment on the Cynthiana Circuit, first met in the home of Birkett Colvin, Sr., of Mt. Vernon. The Cynthiana Circuit, which extended from Cynthiana to Newport, included the counties of Harrison, Pendleton, and parts of Campbell, Kenton and Grant. Leaving the Cynthiana Circuit, the Methodist congregation became a member of a smaller Circuit--The Falmouth Circuit--which was first begun in the year of 1832. Among the ministers who served this small church on the Falmouth Circuit, were Josiah Whitaker (1833-34), great-great-grandfather of Dr. H. W. Whitaker of Ft. Thomas; James C. Crow (1835-36); Joel Peak (1837-38) and William C. Mahon, 1839. Between the years of 1839 and 1854, the time of the erection of the Church building, which is still standing at the corner of Shelby Street and Maple Avenue, we have no record of those who served as pastors. After Paul C. Lair died in 1855, his will, when probated, showed that he had left no heirs to claim the real estate, which he had previously donated to the Falmouth Methodist Society. Mr. Lair's wife, the former Martha Frazer, was a daughter of John Frazer, and she too passed away near this time, leaving no heirs. Thus the Falmouth Methodist Church received a clear title to the lot donated to them by Mr. Lair. According to the court records in the courthouse in this city, George W. Edwards, Robert Purdy, Elisha B. Harcum and James T. Applegate represented the Methodist Episcopal Church, South, and accepted the lot. The first three named were trustees of "Mary's Chapel", the name given the Falmouth Church by Mr. Augustus Robbins, in honor of his devoted and Christian wife, Mary, who was also a daughter of John Frazer and a sister of Mrs. Paul Lair. Augustus Robbins had come to Falmouth from Canada and married Mary Frazer. He kept a small store and was in moderate circumstances. When William Henry Harrison was elected President of the United States on a protective tariff platform, Mr. Robbins was advised to put all the money he had and all he could borrow, on hogs, which were then selling for $1.25 per hundred. Mr. Robbins acted upon this advice, bought all the hogs he could get and transported them down the river and sold them on the market for $3.50 per hundred, thus making a clear profit of $20,000. This enabled Mr. Robbins to do what his heart deeply desired to do during his lifetime--build the church with his own means and present it, free of debt to the congregation. However, the furnishing of the building was left to be financed by the membership. According to the records, the Church was completed by Mr. Lair and Mr. Robbins, together with the other members of the congregation, and the dedicatory service was conducted by Bishop Hubbard H. Kavanaugh in the year 1855. The building at that time had one entrance, facing on Shelby Street with a small vestibule inside the entrance. It was heated by a stove in the center of the room, and the pulpit was in the exact place that it is today, with an organ and the choir on the side. The original building has been twice remodeled, first under the ministry of Rev. D. W. Robertson in 1890 and dedicated by Rev. W. T. Poynter on February 22, 1891. One of the changes made at this time was the removal of the vestibule, which opened on Shelby Street, and replacing it with three large art glass windows. The other windows in the Church were also replaced with art glass ones to match the front three. Two vestibules were then constructed, one on each side of the building making two entrances, as they are today. The second time the building was remodeled was in 1926, under the ministry of Rev. R. R. Rose, and the dedicatory service was held on February 6, 1927, and conducted by Bishop W. F. McMurray. The Church was enlarged by several feet at this time to make room for the seating of the choir behind the pulpit and a small pastor's study at the right of the pulpit. The upper story, with Sunday School rooms, kitchen and dining room, was also added, and a hot water heating system was installed. A balcony was built in the rear of the Church, thus giving the auditorium a seating capacity of about 350. The belfry was added to the top of the Church and the bell from the Presbyterian Church was installed. All through the years, the Methodist and Presbyterian congregations were very closely connected, shaaring each other's pastors at times and their buildings, when needed. At the time of this last remodeling of the Methodist Church, the people of the Methodist congregation used the Presbyterian building for services and the Presbyterian Church, having disbanded, donated their bell for the Methodist tower. The building committee at this time consisted of R. Beverly M. Colvin, Chrm., J. Edward Fossett, L. L. Kirby, John Booher and Roy Wilson. Throughout the numerous changes in the building the pulpit has remained in the same location and the altar rail is the original one, which was placed in the Church 100 years ago. In 1952, a new Hammond Electric Organ was installed in the sanctuary of the Church, under the pastorate of Rev. G. G. Kitson. During the ministry of Rev. R. R. Rose, the Falmouth Church left the Falmouth Circuit and became a station, thus enjoying the services of a full time pastor. The first parsonage for the Circuit was bought and occupied during the ministry of Rev. T. F. Taliaferro in 1881. It was located on North Maple Avenue and was a five room cottage (now the home of Mrs. Myrtie Shoemaker) and occupied two large lots with stable for the pastor's horse, large cistern, well and a cabin on the back of the place. The present parsonage at 510 Maple Avenue was built around 1900, and first occupied by Rev. W. M. Britt. In 1915 extra rooms were added and improvements have been made from time to time. Since the small Methodist Society in 1832, the Church membership has increased to its present number of 290, and all branches of the Church program are well organized and active. A thriving Methodist Men's Methodist Youth Fellowship and Children's Group add greatly to the strength of the Church. Besides the many Christian laymen that the Falmouth Methodist Church has contributed to the community and the world, one minister, Dr. E. M. Fossett, Supt. of the Ashland District of the Kentucky Methodist Conference, received his early Christian training in the Falmouth Methodist Church. 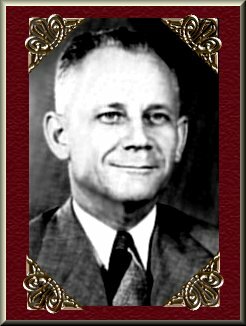 One missionary to the foreign field of Korea, Mr. Myrtle Barker Brannon, now retired and living in Alabama, was a daughter of Rev. T. W. Barker, pastor of the Falmouth Church in 1895. Our Church is justly greateful for the part it has had in the Christian life of these servants of God. Can drive all cares away. Caught in the endless round. And loved ones laid to rest. God's peace about my heart."